Here at The Chicago Embroidery Company, we’ve been creating designs with needle and thread since 1890. A relative of one of our early workers recently discovered some old images from the turn of the last century and was kind enough to share the pictures with us. You can see all of the images on our website. In the early days, each stitch was mapped out, the color, layout and type of stitch were taken into account. This is a manually operated pantograph machine. The operator moves material on a frame and traces the enlarged stiches while the needles are moving in and out. This process is called “punching,” where the design is transformed from a paper drawing to a pattern that will run the loom machine. This is also where the science of embroidery meets the craft as various different punchers had subtle but unique signature styles of laying in the stitches. 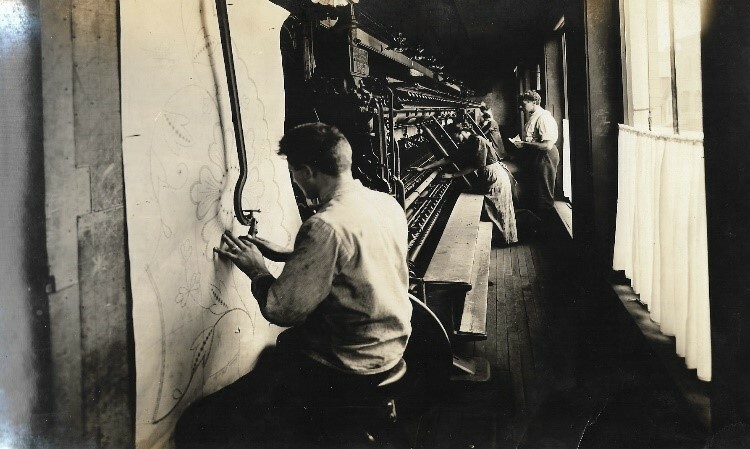 Today, the entire process is run by computers controlling multi-head stitching machines. Let us turn your design into an embroidered work of art. Send your idea/graphic to sales@c-emblem.com, visit our website for a free quote or call 312/664-4232. This entry was posted in Uncategorized by The Chicago Embroidery Company. Bookmark the permalink.